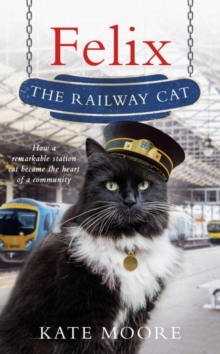 Full of funny and heartwarming stories, Felix The Railway Cat is the remarkable tale of a close-knit community and its amazing bond with a very special cat. When Felix arrived at Huddersfield Railway Station as an eight-week-old kitten, no one knew just how important this little ball of fluff would become. Although she has a vital job to do as ‘Senior Pest Controller’, Felix is much more than just an employee of TransPennine Express. For her colleagues and the station’s commuters, Felix has changed their lives in surprising ways. Felix seems to have a remarkable ability to save the day time and again: from bringing a boy with autism out of his shell to providing comfort to a runaway child shivering on the platform one night. So when tragedy hits the team at Huddersfield, they rely on Felix to pull them together again. But it’s a chance friendship with a commuter that she waits for on the platform every morning that finally gives Felix the recognition she deserves, catapulting her to international stardom…With her very own fan page (www.facebook.com/FelixHuddersfieldStationCat) Felix has already warmed the hearts of over 100,000 followers all around the world. Felix the Railway Cat is packed with stories from her remarkable story so far. ‘A phenomenon’ Big Issue Royalties from the sale of this book will be donated to Prostate Cancer UK (registered charity 1005541, SC039332).